We’re used to long lines to see Michelango’s David in Florence or Gaudi’s Sagrada Familia in Barcelona. When you go to any of the big tourist attractions in Europe, such as The Eiffel Tower, The Vatican, Buckingham Palace, or Rome’s Colosseum, you know their popularity means there will be a large crowd and long lines. 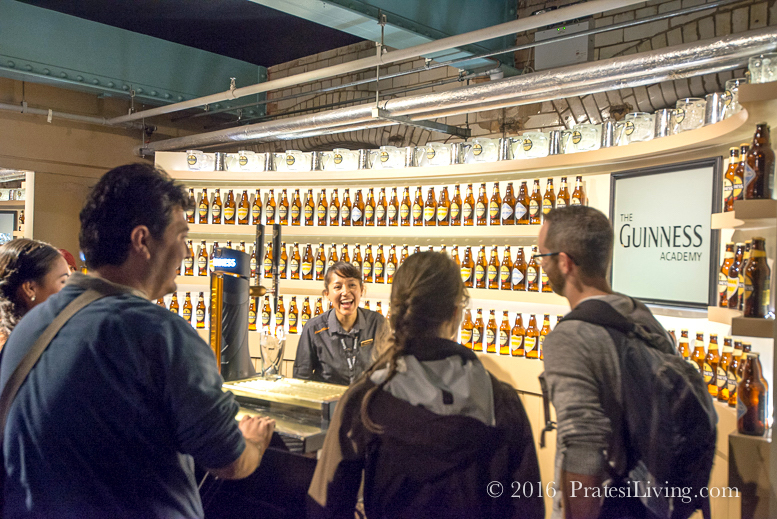 We were told this would be the case when visiting The Guinness Storehouse in Dublin, so we were prepared. It was a cold and cloudy day and the line to get into the the building was very long. The ushers allowed several people to enter at once, but waited for the lines to clear inside before the next small group could enter. And so it went until it was our turn. 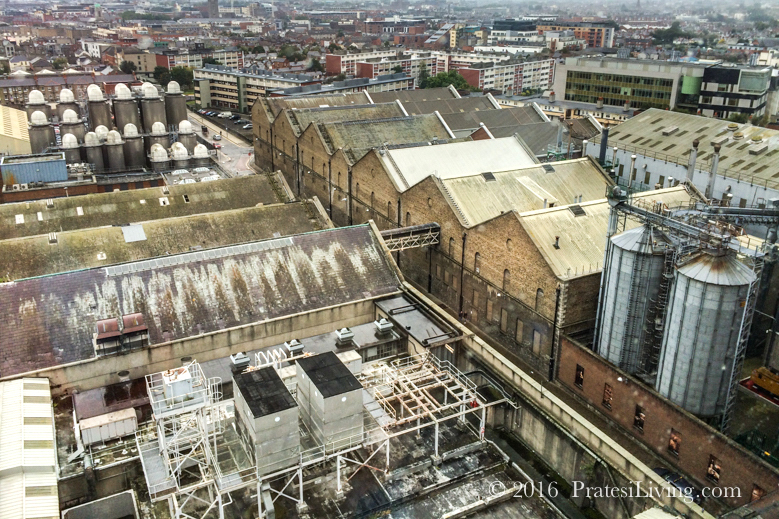 We weren’t sure what to expect as we entered the historical brick building located in an older industrial section of Dublin. It was hard to believe that this many people made the pilgrimage; over 13 million in the past 10 years. 93% of the visitors are from overseas. 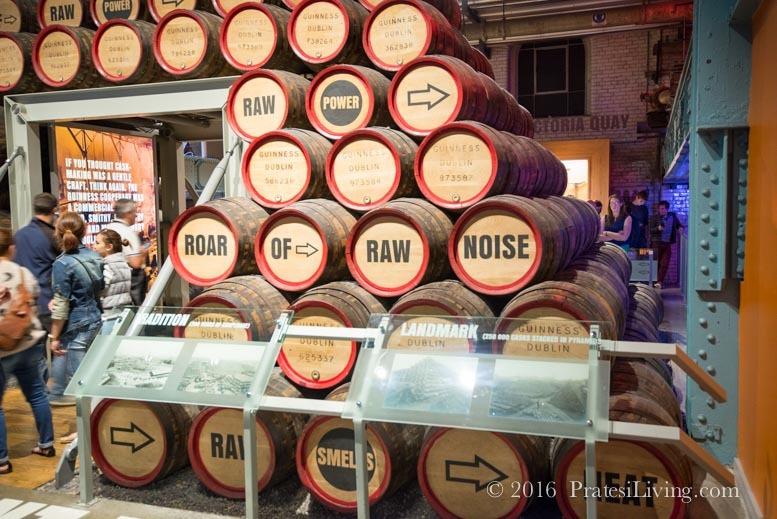 The Guinness Storehouse® is the largest tourist attraction in Ireland and in fact, the most popular in Europe (move over Disney and The Vatican), according to a recent survey. 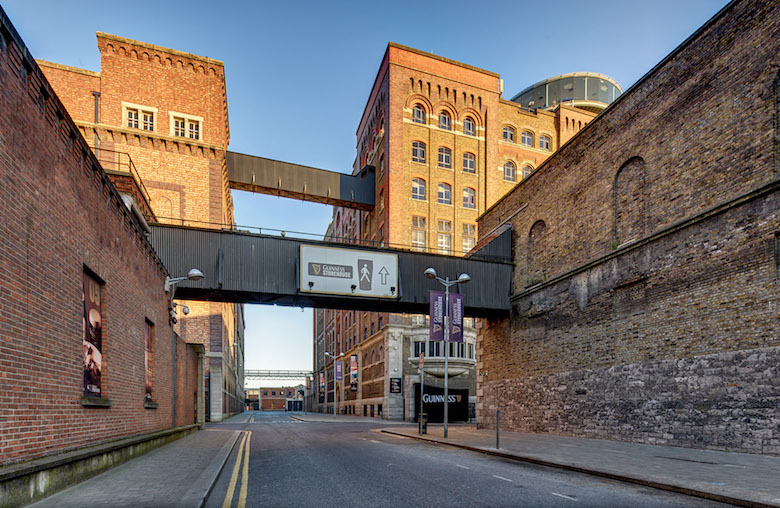 This impressive seven-story visitor experience is located in St. James’s Gate Brewery, the heart of Dublin and home of what is lovingly referred to as “The Black Stuff.” If you’re a Guinness devotee (or even if you’re not, you will be after a visit to The Storehouse), this is a must-see during your Irish adventure. 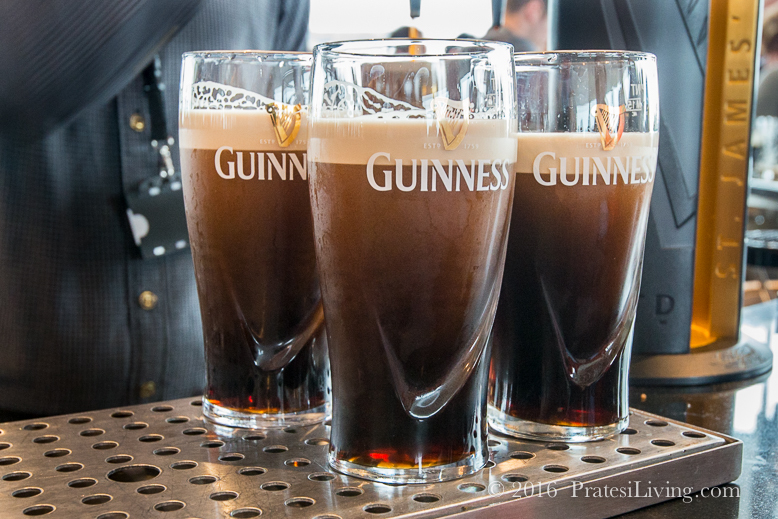 The signature Guinness harp is also the Coat of Arms of Ireland and Guinness is the biggest export from the Emerald Isle. 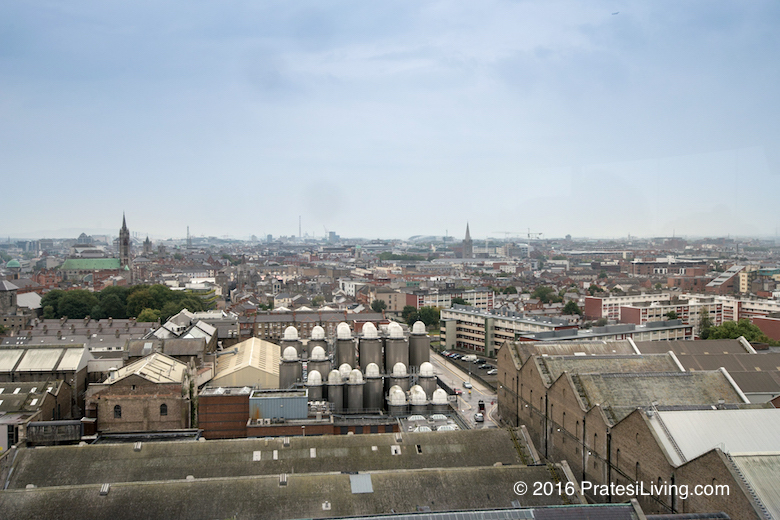 The tour begins at the bottom of the world’s tallest pint glass, on the first level, where the original 9,000 year lease (at £45 per year) for the land between the government (who owned the land), and Arthur Guinness was signed in 1759, and is now preserved. You can learn first-hand the 250 year-old history of Guinness walking through the exhibit while watching old television advertisements. 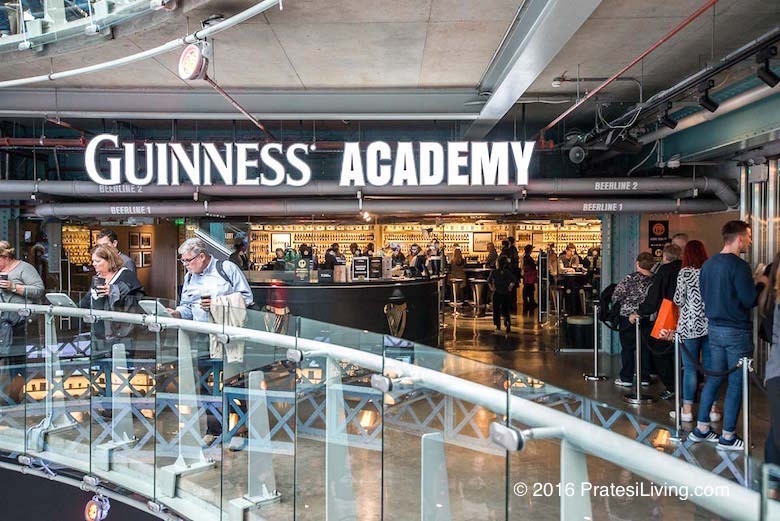 Learn how the stout is made and the special fermentation process, and how to pour a proper pint at the Guinness Academy. The Connoisseur’s Experience offers an exclusive tasting of Guinness Draught, Original, Foreign Extra Stout, and Black Lager and there are two restaurants (one formal and the other casual) where you can enjoy traditional Irish food along with your Guinness. There’s also Arthur’s Bar, which features an authentic pub atmosphere. 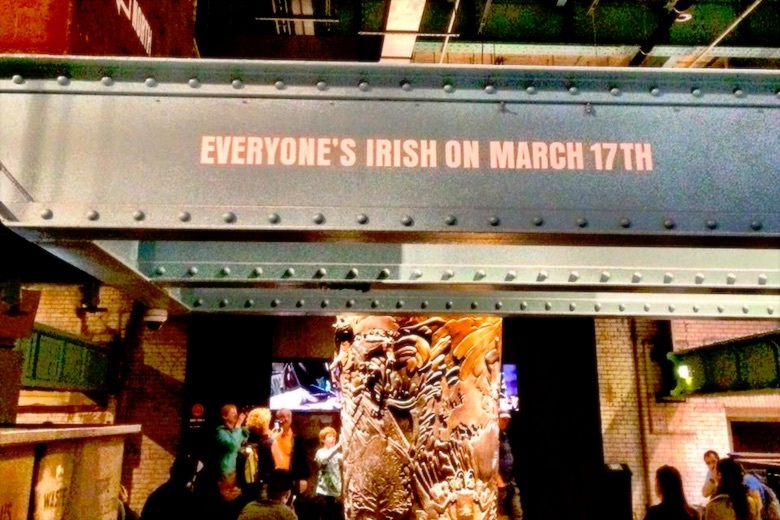 Guinness is a marketing miracle. 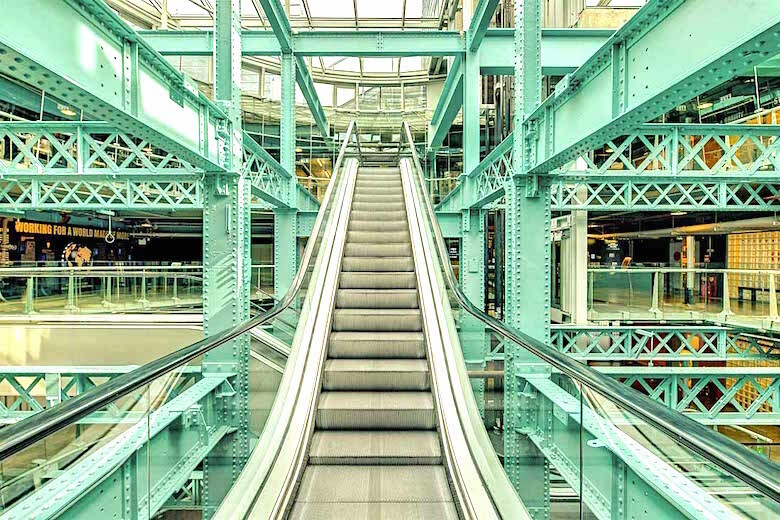 The folks at Guinness needed to breathe new life into an aging brand and their marketing prowess, as well as building The Storehouse attraction, did just that. 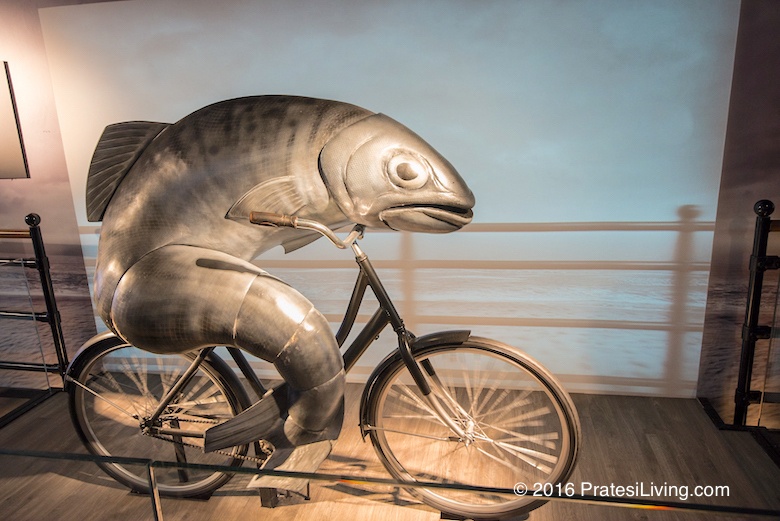 Quirky but effective, who can forget the singing clam, the bicycling fish, or the whistling toucan? 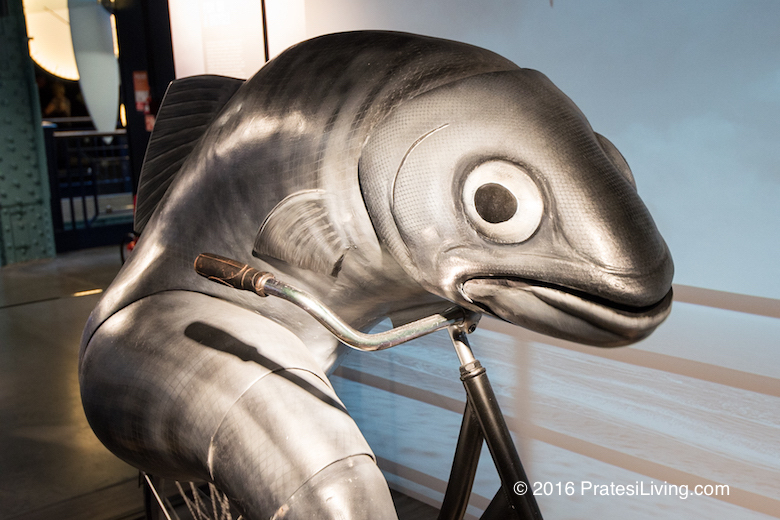 You can tour the exhibit of past marketing campaigns as part of the Guinness Experience. You might also enjoy this short video we created with their singing clam. 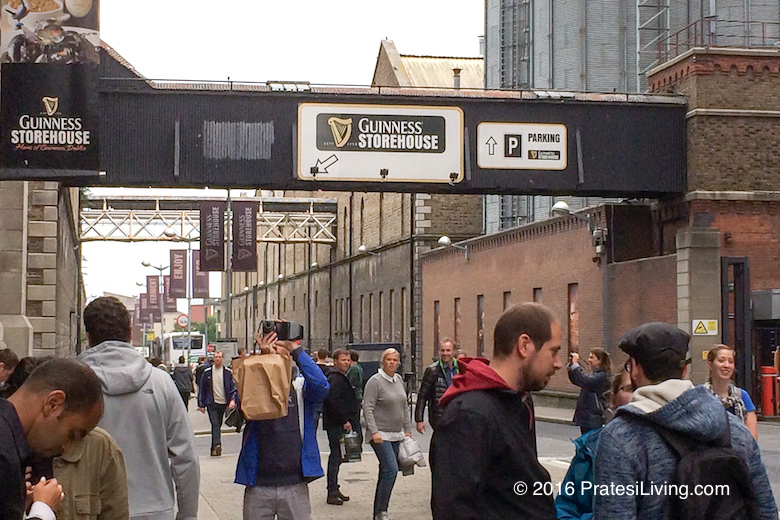 We have to believe one reason so many people make the journey to The Storehouse is the difference in taste of the Guinness here versus what is available in their home country. 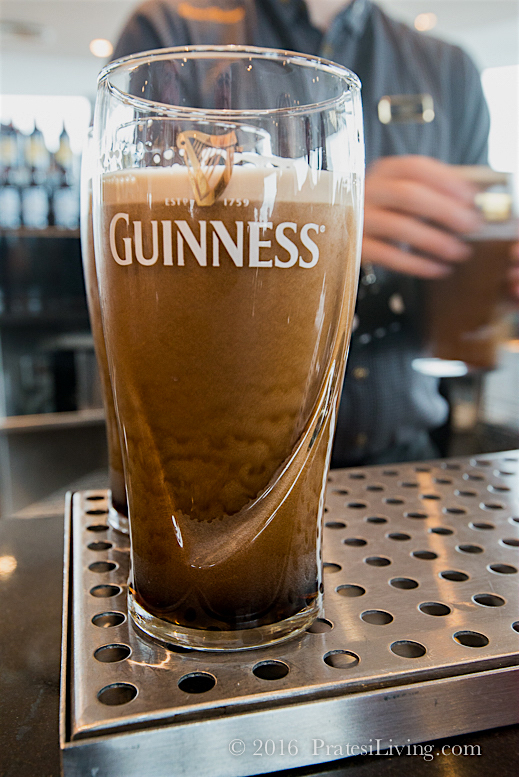 Sure, the Guinness in Ireland is fresher and tastes different than it does in your local pub in the States, Australia, or anywhere else in the world, but the richness, smoothness, and creaminess with the depth of flavors can’t be experienced anywhere else but at the brewery. It was truly unique. 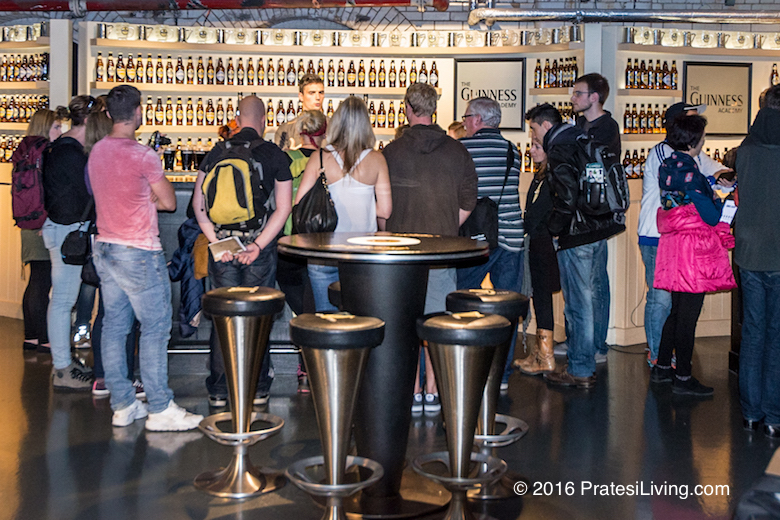 So on your Irish adventure, be sure to queue up for the Guinness Experience. 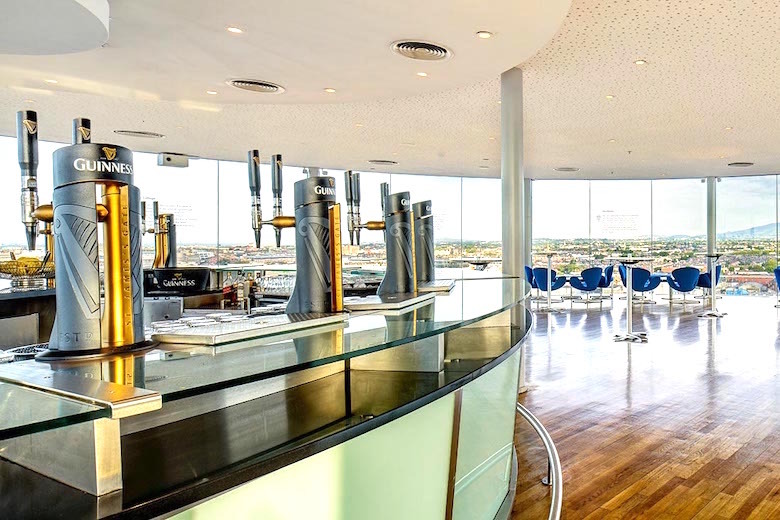 The grand finale is a visit to the 7th story rooftop Gravity Bar where you’ll receive your pint as part of the price of admission and enjoy the 360-degree views of the city. Don’t forget to stop in the retail store for unique Guinness items. 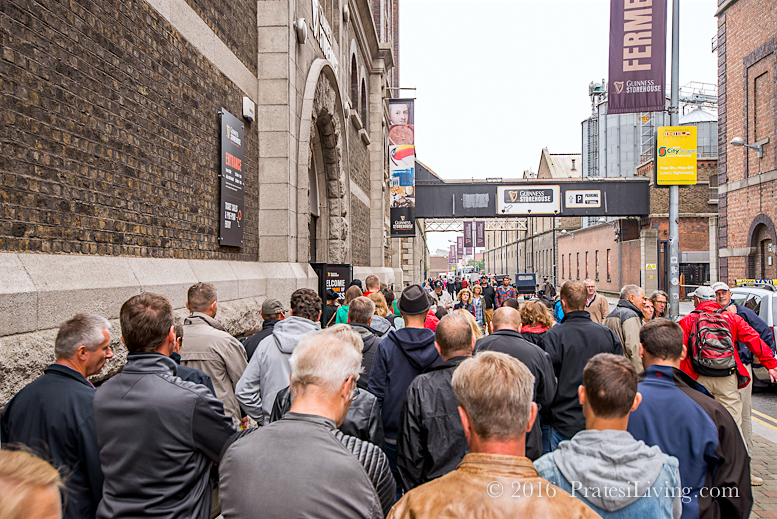 Plan a little extra time for your visit since The Guinness Storehouse stays busy and you’ll probably have to wait in line both to get in the door and to see some of the exhibits. 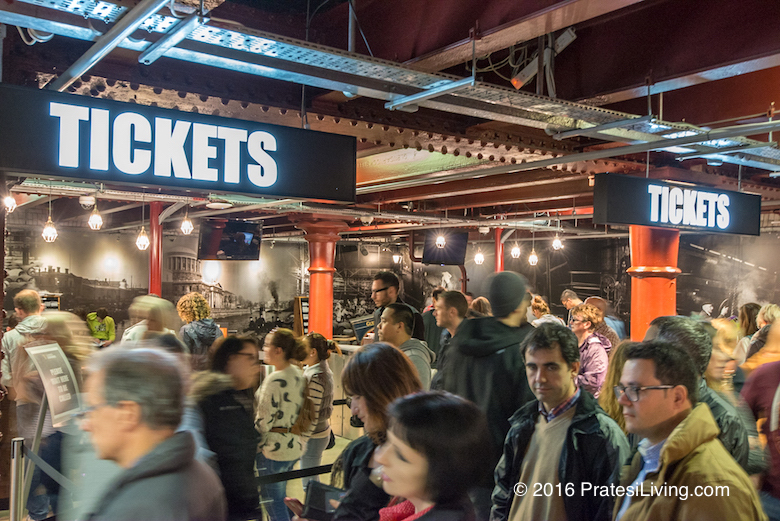 Now, if we could only get them to serve up some Guinness while we’re waiting in lines, we might enjoy the experience even more! With St. Patrick’s Day just around the corner, in addition to drinking Guinness, we suggest you cook and bake with it, too. Here is one of our favorite chocolate cake recipes, Guinness Stout and Chocolate Cupcakes. The Guinness enhances the chocolate flavor and creates a very moist cupcake. Combined with the cream cheese frosting, you’ll find yourself making these all year long, not just during the month of March.